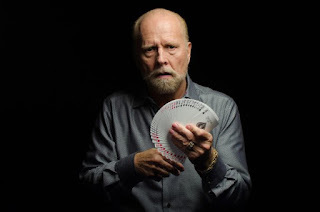 This fascinating documentary explores the everyday life of Richard Turner, the inconceivable card mechanic whose skills are unbelievable to everyone in his industry. This man has practiced with cards for most of his life and the audience is lead to learn that he has an unimaginable card collection. What the film tackles is Ric’s unwavering stance on how he would like to be recognized. He is legally blind in both eyes and still does not want to be put in a box in regards to his talents. This man is truly an enormous amazement to millions of people. What Ric says in the film is fully comprehendible as he states that he would just like his accomplishments to be judged on their own merit. There is a montage of interviewers stating that he is blind or using his condition to explain his excelling in cards. This angers Ric to a huge extent and as a viewer of the film I can completely understand. The movie was highly entertaining in that it went to The Magic Castle in Los Angeles and many other places. Several tricks were consisted of in the cut that were close-up and mind-boggling. Ric’s definitely outstanding personality was celebrated in the documentary. He has a ton of energy and a fantastic sense of humor. In one shot we see a sign on the side of his residence stating that in a year long ago “nothing happened here”. From that point forward, I could get the gist of how Ric liked to play around. There was truly a rewarding scene that involved him speaking with a deaf man that was pretty interesting to watch. The reward came when the deaf man spoke to the camera of how usually deaf people are scared of blind people. Yet, Richard was so friendly that this man was in complete ease. The film had several slick shots of cards being handled with clear expertise. When I realized how hard Richard worked to get to where he was, I became in awe and the “handicap” reason became so juvenile to me. This film was such an insight into the world of magic and card mechanics. It kept you thoroughly engaged the entire length of the show. Ric’s son provides a lot of comedy in his reactions to his father after years of being heavily involved with him. This is an all-around eye-catcher that is sure to please everyone in the crowd.